I'll just come out and say it; Trail of Cthulhu is controversial. It's a new school game and uses mechanics that feel very different from the simulation approach of 1970's games. 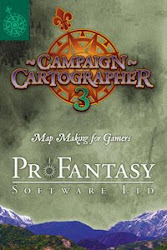 It shares a common setting with Call of Cthulhu, and it's fairly easy to convert back and forth between the two systems. Furthermore, Pelgrane Press is challenging the status quo with a lot of interesting supplements, many of which I'll review as the year goes on, so Trail of Cthulhu is worth a close look. The physical book is amazing - much of the art is photo realistic, brooding, and ominous. There are many full page prints of intrepid investigators or explorers dwarfed by alien ruins, strange monuments, or haunted locales, and it captures the spirit of the game perfectly. 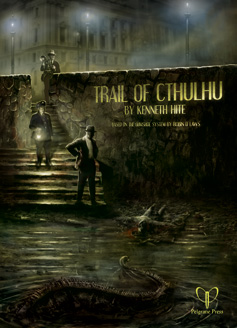 It’s written by Kenneth Hite, and there's a ton of Mythos scholarship and useful ideas for Cthulhu games. The book is published by Pelgrane Press and uses their Gumshoe system; Gumshoe shows up in most of their games: Esoterrorists, Fear Itself, Mutant City Blues, Ashen Stars, and the upcoming Night's Black Agents. Before we get too far talking about all the things Trail of Cthulhu does right, let's take a side track and talk about how the Gumshoe system works. (I'll refer to Trail of Cthulhu as TOC here on out). Gumshoe characters don't have Call of Cthulhu (COC) style attributes like strength, intelligence, size, education, etc., instead they have abilities like Athletics, or Forensics. The player can surmise an athletic character is probably strong, and a guy with good technical skills is probably smart. A character with skill in an ability (for instance, forensics) is an expert in that area. TOC is an investigative game, and a guy with skill in forensics will automatically find the appropriate clues just by searching a scene and bringing forensics. The other thing about having a rating in a skill is that it also gives you a pool of points you can spend during the investigation to excel. Let's say you have skill with Latin; you could normally translate that loose page of De Vermis Mysteriis in a few hours back in your study. But if you spend a point out of your pool, maybe you can read it directly, on the fly, or translate it in a fraction of the normal time - as long as the player can come up with a snappy reason for their moment of excellence. The GM can also assign bonus clues for point spends, but I prefer treating point spends as rewards for quick thinking and player improvisation. Besides the investigative abilities, all of the conflict skills are abilities, too - "general abilities". Conflict skills require dice rolls, and points can be spent to improve the chance of success. A typical guy can be hit in combat on a 3 or higher on a d6, so even a single point spent on the d6 roll improves the odds dramatically. What the two sets of pools means is that TOC puts a lot of emphasis on resource choices. Players need to gauge how much they're going to need those points later and spend wisely. Investigation skills only refresh in between completed adventures, whereas general ability pools refresh daily, or partially after periods of short rest. It can be a little hard to visualize how this plays out differently from a Call of Cthulhu situation, so let's look at how a few situations might be handled in the two rules sets. Building gun-oriented characters in a Cthulhu game isn't generally a good idea, but let's assume you're a Morose Veteran of the Great War with 80% in rifle (COC style). Early in the game, late in the game, doesn't matter, whenever your guy drops prone with his rifle and takes a shot, he'll be shooting at 80%. Whether he makes an awesome shot is out of the player's control; he needs to roll the dice and see what happens, explaining the results after seeing the roll. You don't get to choose when you're awesome (but when you do roll that 16% and make a critical/impale, everyone cheers). In the TOC system, the same character would have a lot of points in firearms (let's say he has Firearms 12). Many monsters have higher hit thresholds (4 or 5 on a d6) so the player might need to spend 2-3 points per shot to ensure he's always hitting his target. Unlike the COC player, the TOC player can choose to pump a lot of points and ensure he hits. He may even get an extraordinary result with a good roll, exceeding the monster's hit threshold by enough to do extra damage. But later in the session, when all of those firearms pool points are spent, he's down to straight rolls. "I'm spent". In TOC, you lose some of the suspense that comes when all of your success is contingent on a dice roll. The tension is different; you're constantly wondering, will you need those points later, did you choose to spend wisely? It has echoes of resource management from the survival horror genre, as points dwindle and choices get tough. It's a different qualitative feeling than hoping for lucky rolls. Another difference is that Trail of Cthulhu resolves narrative investigation differently than dramatic conflict. Let's take the example of a locked door. During an investigation, a character with the locksmith skill can automatically get through the door to the clue on the other side. However, when the group is being chased by a hideous monster, and they need to open the same kind of lock to escape, a dice roll is required and the player would need to spend some points to ensure success. The mechanics change depending on whether it's exploration or combat. 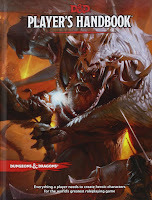 Before you cry foul, keep in mind that versions of D&D have had things like take 10 or take 20 on skill checks, implying that skills during exploration are different than execution under a pressure situation. The ability to refresh pool points at arbitrary intervals is not much different than 4E's use of replenishing Encounter or Daily powers, or even spell memorization. I tend to think older gamers, ingrained in 70's and 80's RPG styles, are more comfortable with success based on dice rather than the resource spends. I've seen questions regarding the Gumshoe clue system; what fun is it if characters always find the right clues? Here's the thing: you built your guy to be a professor of dead languages; you find the cultist's journal, and it has notes in archaic Greek; since you can read ancient Greek, you can read the notes. The fun isn't whether you make or fail a roll, it's what the group does puzzling over this new bit of information you've discovered, and how this changes their plans moving forward. In games where skill rolls are required to get basic clues, you can end up doing a fair amount of "pixelbitching" once the main guy fails his check. "Crap, I missed my Greek roll on the journal. Now what do we do?" Invariably, it involves using a fall back skill (like Luck or an Idea Roll) to see if a Deux Ex Machina is around to help with that translation; or worse, the barely trained other characters in the group make off-the-wall rolls hoping for a critical success. "Yeah, I only have 5% in Ancient Greek, but I rolled a 04% - take that, Professor! Looks like your 90% in Ancient Greek were points well spent, har har!" It's no fun when groups miss necessary clues through bad rolls. If they ask the right questions and have the right skills, they should get the clues. Most Call of Cthulhu Keepers familiar with the problem either fudge dice or ignore the skill check rolls for necessary skills; TOC makes it an explicit design element. Another way that TOC is a modern design vs an old school design are the mechanics that shift narrative control to the players. I already alluded to the investigative abilities, and how a player can choose to spend points, do a little improv, and generate their own spotlight moments. For instance, having the right Flattery skill might get you into the hotel conference; spending some Flattery points and making up a little story for the hotel clerk might get the players a room on the same floor as their target, or a back stage pass. Cha ching. TOC characters have a new mechanic called a "Drive" - a drive is the personality quirk that makes them open to investigating eldritch horrors in the first place. It could be something like Curiosity, a sense of Adventure, or boredom (Ennui). When characters fulfill their drives, they replenish mental Stability points. Drives can also be a stick that penalizes them when they're ignored. Let's look at an example. In COC, the group of characters follow the bloody footprints out of the front door to the street, where the man-hole cover lies ajar. "Dude, I am not going into that dark sewer following a rotted corpse. Let's go back to the mansion and come back in the morning. With shotguns". That's how gamers think - like gamers, not like the neurotic protagonists in a horror story. TOC's Drives ensure the characters have a good reason to throw caution to the wind like their literary forebears in the horror genre. In this situation, at least one of the players would want to slide the manhole cover aside and look down the hole, for the chance to score some quick Stability points by demonstrating their insatiable Curiosity, or sense of Adventure. TOC kept the same kind of Sanity death spiral you see in COC, so there are plenty of options for investigator madness; keeping with its tone of encouraging more player control, many of the insanities involve the entire table "reinforcing" the insane investigator's new, warped world view. The book has a lot of elements that are useful in regular Call of Cthulhu campaigns, even if you skip out on the Gumshoe system. TOC introduced the idea of Pulp vs Purist styles of play - more gun-wielding, weird adventure versus the bleak nihilism of Lovecraft's grim stories (think of The Dunwich Horror as a pulp story, and The Colour Out of Space as a Purist story). There is great practical advice on structuring investigations and building out mystery scenarios, and examples of "campaign frames" - narrative structures for investigation games. The original COC rules don't provide any of that campaign support, and I look at the TOC ideas fairly often. I owe the readership here an article on narrative structures for Cthulhu gaming, so I'll defer a discussion on campaign frames for now, and return to it real soon. The Mythos monsters and entities are very well done, and each major entity is given numerous rationales or explanations that surrounds the beastie with a sense of mystery and horror. The COC book, with it's dry statistics and monster-manual-style of presentation, has had the unfortunate effect of making those Mythos horrors a bit banal after 30+ years. Finally, Pelgrane Press has created a praiseworthy body of work, stretching the limits of Cthulhu gaming with titles like Bookhounds of London, Shadows over Filmland, Cthulhu Apocalypse, and The Armitage Files. I'll be reviewing many of the Pelgrane titles as the year goes on, as they hold interest for both TOC or COC Keepers. Because both games are light on rules, I find it's really easy to convert back and forth, running TOC materials using the COC rules - after a while, you stop seeing green code fragments, just blonde, brunette, red head…. We've played a fair number of Trail of Cthulhu one-shots the past few years; the greater emphasis on pregenerated characters with back stories, Drives, improvisational role playing, and bleak, Purist destruction, makes it ideal for one-shots and change of pace games - everybody dies or goes bonkers. I expect we'll be doing some classic Call of Cthulhu games this spring and summer, while importing some of the TOC enhancements to the art. Although I like it quite a bit, we've never given Trail a run as a campaign game. Hopefully I've given folks that aren't sure which style they'd prefer, Call of Cthulhu or Trail of Cthulhu, some qualitative information to illuminate the differences and help any decisions on system. I'm glad to discuss the two games more in the comments. I have the game, but haven't had the chance to play it yet. I do like it though, and the emphasis on automatic clue gathering sits well with me. I'm also very tempted by the Apocalypse adventure, which looks like a great idea. I look forward to your reviews of the supplements for the game. Good review. I've never played it, but I like the philosophy behind the game and find it well but together. It's worth it even just to mine for ideas. The various alternate takes on Mythos entities alone is worth the cover price. Thanks for an excellent review. I'm a long time Call of Cthulhu player, but I've found that as my group gets older (and sadly meets a lot less frequently) we only really have time for one-shots. I'm definately tempted to give ToC a go. Thanks again. Sidney, take the term "one-shot" loosely. 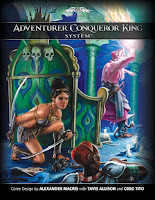 There's not a ton of Trail adventures optimized for a single night of 3-4 hours of play; there are a lot of short $5 PDF adventures, but I find they tend to take two nights (3 hours a session). They feature pregens, back stories, and compelling hooks to jump right in. One of the short scenarios often used at conventions is Devourers in the Mist; it shows up in one of the collections (Stunning Eldritch Tales, I believe). I use ToC the same way you do, as a font of inspiration for my CoC games. The different takes on individual Mythos entities are indeed one of my favorite parts of the book, and I'm going to try to incorporate Drives into my next CoC campaign. The explicit element of Core Clues has also caused me to rethink how I approach asking for skill rolls. In your Ancient Greek example above, for instance, I would not have asked for a roll if someone had the skill even at 75% (which I believe is the threshold for "professional expertise"). Only if they were trying to read the text in a hurry or under duress would a roll be necessary in my opinion. I've tried running ToC for my group, but they're just not feeling it. They prefer "classic" mechanics and don't hold with all this new-fangled design, apparently. Note that several of the people in my group (the majority, in fact) are new to gaming, some having just started last year, so it can't be simply an issue of nostalgia or being set in one's ways. Maybe CoC feels more "properly" game-like, with its random rolls and such? I think it's a fair point - the way I articulate the differences, COC simulates characters in a Lovecraftian setting; TOC simulates characters in a Lovecraftian story. TOC's mechanics support dramatic ends, and it shifts a lot of responsibility to the players to choose when to spend their points (and role play or improvise accordingly). If I could get some of my wife's improv actors up for a game night, it's the one I'd play, no doubt about it. TOC's mechanics give the players direct access to shape the story, choose moments of excellence, and gain rewards or benefits for role playing choices (based on drives and pillars of sanity). Many of the TOC purist scenarios end with everyone dead or bonkers, reinforcing the experience of being part of a bleak, Lovecraftian story. It's a much different view point than COC. The only caveat I'll add is, we haven't tried running a free-form TOC campaign, just some of the short PDF packages. The name Trail of Cthulhu reminds me of Oregon Trail. I now know the "trail" is in the investigative sense of "on the trail of X" but for a while I assumed this was a Cthulhu game set in the frontier times of America.